False Alarm Mammograms May Still Signal Higher Breast Cancer Risk : Shots - Health News Largest study to date finds women who have abnormal mammograms but negative results from further tests have a somewhat higher risk of developing breast cancer during the next 10 years. In a study of 1.3 million women, ages 40 to 74, having a false positive on a screening mammogram was associated with a slightly increased chance that the woman would eventually develop breast cancer. The extra risk seemed to be independent of the density of her breasts. The absolute increase in risk amounts to about 1 additional cancer in every 100 women who have a false positive mammogram over a 10-year period, she says. But when put another way, the numbers may appear alarming. The study divided women into two groups — those who got additional imaging and those who also got biopsies. 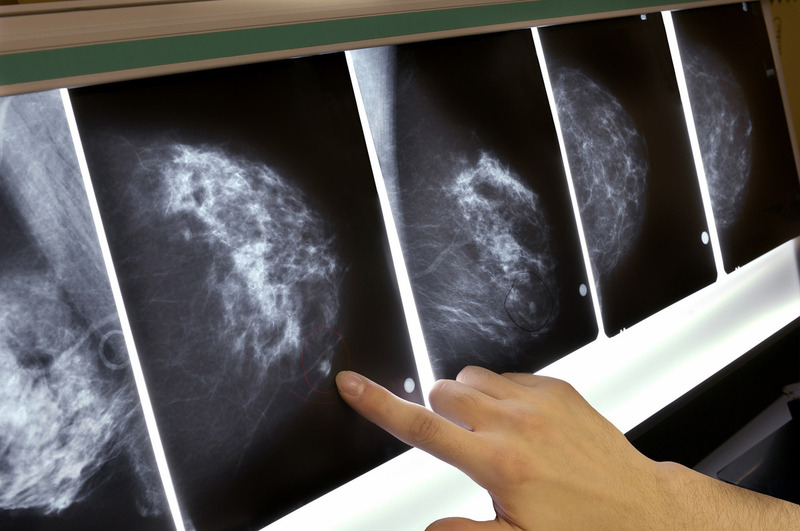 Women with an abnormal screening mammogram had a 39 percent higher risk of cancer if they got additional imaging that turned out to be negative, too. That's compared with women who were truly negative and never developed breast cancer. For women who got biopsies that turned out negative, the chance of cancer was increased by 76 percent over the next 10 years. "We don't want women to read this and feel worried," Henderson says. Instead, the findings should be considered one more "useful tool" when weighing all the other factors that might be raising a particular woman's risk, such as age, race, breast density and family history of breast cancer. Henderson says the study wasn't designed to figure out why a falsely positive mammogram is associated with an increased cancer risk. It's possible, she says, that the increased risk "could be the fact that the radiologist sees an abnormal pattern that's not cancerous, but it's a radiographic marker," and it could be that this is a precursor to some subsequent cancer diagnosis. The study, done at several leading universities, looked back at more than 2.2 million screening mammograms considered to be false alarms between 1994 and 2009. It was published Wednesday in Cancer Epidemiology, Biomarkers & Prevention. The mammograms were done in 1.3 million women, ages 40 to 74. Earlier studies have had conflicting results. But the size of this study makes researchers more confident that whatever is going on is a true phenomenon and not chance, says Dr. Richard Wender, chief cancer control officer of the American Cancer Society. "If you've had a false positive, that is a risk factor," he says, "so it's very important that a woman stay up to date with regular mammography." As it is now, Wender says, at least one-third of women who should be getting routinely screened for breast cancer are falling behind schedule. The cancer society created controversy in October, when it changed its guidelines to recommend that regular screening start at age 45. Other groups recommend starting earlier, at age 40, and some say it's OK to wait until age 50. Studies have shown that the chance of getting an abnormal screening mammogram that is falsely positive is about 50 percent over the course of 10 years. That often leads to further testing, including more mammograms, possible ultrasound exams, MRIs and even biopsies.